^ Seidelmann, P. Kenneth; Archinal, B. A.; A’Hearn, M. F.; et al. (2007). “Report of the IAU/IAGWorking Group on cartographic coordinates and rotational elements: 2006” (英語). Celestial Mechanics and Dynamical Astronomy 90 (3): 155–180. doi:10.1007/s10569-007-9072-y. http://adsabs.harvard.edu/doi/10.1007/s10569-007-9072-y 2011年5月5日閲覧。. ^ Stuart Ross Taylor (2001). Solar system evolution: a new perspective : an inquiry into the chemical composition, origin, and evolution of the solar system (2nd, illus., revised ed.). Cambridge University Press. p. 208. ISBN 0-521-64130-6. ^ Michtchenko, T. A.; Ferraz-Mello, S. (February 2001). “Modeling the 5 : 2 Mean-Motion Resonance in the Jupiter–Saturn Planetary System”. Icarus 149 (2): 77–115. doi:10.1006/icar.2000.6539. ^ Ridpath, Ian (1998). Norton's Star Atlas (19th ed.). Prentice Hall. ISBN 0-582-35655-5. ^ Herbst, T. M.; Rix, H.-W. (1999). Guenther, Eike; Stecklum, Bringfried; Klose, Sylvio. ed. Star Formation and Extrasolar Planet Studies with Near-Infrared Interferometry on the LBT. San Francisco, Calif.: Astronomical Society of the Pacific. pp. 341–350. Bibcode 1999ASPC..188..341H. ISBN 1-58381-014-5. ^ a b c d e f Burgess, Eric (1982). 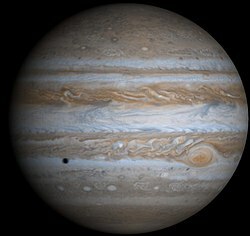 By Jupiter: Odysseys to a Giant. New York: Columbia University Press. ISBN 0-231-05176-X. ^ Shu, Frank H. (1982). The physical universe: an introduction to astronomy. Series of books in astronomy (12th ed.). University Science Books. p. 426. ISBN 0-935702-05-9. ^ Davis, Andrew M.; Turekian, Karl K. (2005). Meteorites, comets, and planets. Treatise on geochemistry,. 1. Elsevier. p. 624. ISBN 0-08-044720-1. ^ a b Seager, S.; Kuchner, M.; Hier-Majumder, C. A.; Militzer, B. (2007). “Mass-Radius Relationships for Solid Exoplanets”. The Astrophysical Journal 669 (2): 1279–1297. arXiv:0707.2895. doi:10.1086/521346. ^ Guillot, Tristan (1999). “Interiors of Giant Planets Inside and Outside the Solar System”. Science 286 (5437): 72–77. doi:10.1126/science.286.5437.72. PMID 10506563. http://www.sciencemag.org/cgi/content/full/286/5437/72 2007年8月28日閲覧。. ^ Burrows, A.; Hubbard, W. B.; Saumon, D.; Lunine, J. I. (1993). “An expanded set of brown dwarf and very low mass star models”. Astrophysical Journal 406 (1): 158–71. Bibcode 1993ApJ...406..158B. doi:10.1086/172427. ^ a b c d e f g h i j k l m Elkins-Tanton, Linda T. (2006). Jupiter and Saturn. New York: Chelsea House. ISBN 0-8160-5196-8. ^ a b c d Guillot, T.; Stevenson, D. J.; Hubbard, W. B.; Saumon, D. (2004). “Chapter 3: The Interior of Jupiter”. In Bagenal, F.; Dowling, T. E.; McKinnon, W. B. Jupiter: The Planet, Satellites and Magnetosphere. Cambridge University Press. ISBN 0-521-81808-7. http://web.gps.caltech.edu/faculty/stevenson/pdfs/guillot_etal'04.pdf. ^ Bodenheimer, P. (1974). “Calculations of the early evolution of Jupiter”. Icarus. 23 pages=319–25 (3): 319. Bibcode 1974Icar...23..319B. doi:10.1016/0019-1035(74)90050-5. ^ Guillot, T.; Gautier, D.; Hubbard, W. B. (1997). 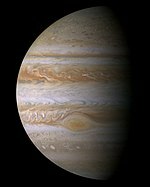 “New Constraints on the Composition of Jupiter from Galileo Measurements and Interior Models”. Icarus 130 (2): 534–539. Bibcode 1997astro.ph..7210G. doi:10.1006/icar.1997.5812. ^ Various (2006). McFadden, Lucy-Ann; Weissman, Paul; Johnson, Torrence. ed. Encyclopedia of the Solar System (2nd ed.). Academic Press. p. 412. ISBN 0-12-088589-1. ^ Züttel, Andreas (September 2003). “Materials for hydrogen storage”. Materials Today 6 (9): 24–33. doi:10.1016/S1369-7021(03)00922-2. ^ Guillot, T. (1999). “A comparison of the interiors of Jupiter and Saturn”. Planetary and Space Science 47 (10–11): 1183–200. Bibcode 1999astro.ph..7402G. doi:10.1016/S0032-0633(99)00043-4. ^ Alvin Seiff. Dynamics of Jupiter's atmosphere. Nature. 2000; 403: 603-605. ^ Gautier, D.; Conrath, B.; Flasar, M.; Hanel, R.; Kunde, V.; Chedin, A.; Scott N. (1981). 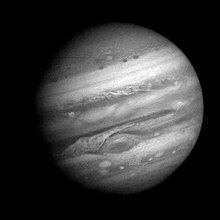 “The helium abundance of Jupiter from Voyager”. Journal of Geophysical Research 86 (A10): 8713–8720. Bibcode 1981JGR....86.8713G. doi:10.1029/JA086iA10p08713. ^ Kunde, V. G. et al. (September 10, 2004). “Jupiter's Atmospheric Composition from the Cassini Thermal Infrared Spectroscopy Experiment”. Science 305 (5690): 1582–86. Bibcode 2004Sci...305.1582K. doi:10.1126/science.1100240. PMID 15319491. http://www.sciencemag.org/cgi/content/full/305/5690/1582 2007年4月4日閲覧。. ^ Kim, S. J.; Caldwell, J.; Rivolo, A. R.; Wagner, R. (1985). “Infrared Polar Brightening on Jupiter III. Spectrometry from the Voyager 1 IRIS Experiment”. Icarus 64 (2): 233–48. Bibcode 1985Icar...64..233K. doi:10.1016/0019-1035(85)90201-5. ^ Niemann, H. B.; Atreya, S. K.; Carignan, G. R.; Donahue, T. M.; Haberman, J. A.; Harpold, D. N.; Hartle, R. E.; Hunten, D. M.; Kasprzak, W. T.; Mahaffy, P. R.; Owen, T. C.; Spencer, N. W.; Way, S. H. (1996). “The Galileo Probe Mass Spectrometer: Composition of Jupiter's Atmosphere”. Science 272 (5263): 846–849. Bibcode 1996Sci...272..846N. doi:10.1126/science.272.5263.846. PMID 8629016. ^ Lodders, Katharina (2004). 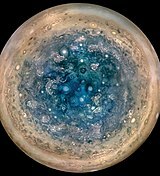 “Jupiter Formed with More Tar than Ice”. The Astrophysical Journal 611 (1): 587–597. doi:10.1086/421970. http://www.journals.uchicago.edu/doi/full/10.1086/421970 2007年7月3日閲覧。. ^ a b Seiff, A.; Kirk, D.B. ; Knight, T.C.D. et al. (1998). “Thermal structure of Jupiter's atmosphere near the edge of a 5-μm hot spot in the north equatorial belt”. Journal of Geophysical Research 103 (E10): 22857–22889. Bibcode 1998JGR...10322857S. doi:10.1029/98JE01766. ^ * Miller, S.; Aylword, A.; Milliword, G. (2005). “Giant Planet Ionospheres and Thermospheres: the Importance of Ion-Neutral Coupling”. Space Science Reviews 116 (1-2): 319–343. Bibcode 2005SSRv..116..319M. doi:10.1007/s11214-005-1960-4. ^ Kerr, Richard A. (2000). “Deep, Moist Heat Drives Jovian Weather”. Science 287 (5455): 946–947. doi:10.1126/science.287.5455.946b. http://www.sciencemag.org/cgi/content/full/287/5455/946b 2007年2月24日閲覧。. ^ Covington, Michael A. (2002). 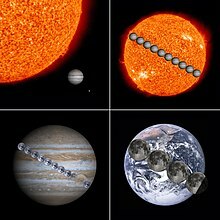 Celestial Objects for Modern Telescopes. Cambridge University Press. p. 53. ISBN 0-521-52419-9. ^ Denning, W. F. (1899). “Jupiter, early history of the great red spot on”. Monthly Notices of the Royal Astronomical Society 59: 574–584. Bibcode 1899MNRAS..59..574D. ^ Kyrala, A. (1982). 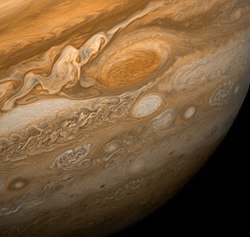 “An explanation of the persistence of the Great Red Spot of Jupiter”. Moon and the Planets 26 (1): 105–7. Bibcode 1982M&P....26..105K. doi:10.1007/BF00941374. ^ Sommeria, Jöel; Steven D. Meyers & Harry L. Swinney (February 25, 1988). “Laboratory simulation of Jupiter's Great Red Spot”. Nature 331 (6158): 689–693. Bibcode 1988Natur.331..689S. doi:10.1038/331689a0. ^ Musotto, S.; Varadi, F.; Moore, W. B.; Schubert, G. (2002). “Numerical simulations of the orbits of the Galilean satellites”. Icarus 159 (2): 500–504. doi:10.1006/icar.2002.6939. http://cat.inist.fr/?aModele=afficheN&cpsidt=13969974. ^ Showalter, M.A. ; Burns, J.A. ; Cuzzi, J. N.; Pollack, J. B. (1987). “Jupiter's ring system: New results on structure and particle properties”. Icarus 69 (3): 458–98. Bibcode 1987Icar...69..458S. doi:10.1016/0019-1035(87)90018-2. ^ Burns, J.A. ; Hamilton, D.P. ; Showalter, M.R. (2001). “Dusty Rings and Circumplanetary Dust: Observations and Simple Physics”. In Grun, E.; Gustafson, B. A. S.; Dermott, S. T.; Fechtig H. (pdf). Interplanetary Dust. Berlin: Springer. pp. 641–725. ^ a b Burns, J. A.; Showalter, M.R. ; Hamilton, D.P. ; et al. (1999). “The Formation of Jupiter's Faint Rings”. Science 284 (5417): 1146–50. Bibcode 1999Sci...284.1146B. doi:10.1126/science.284.5417.1146. PMID 10325220. ^ Fieseler, P.D. (2004). “The Galileo Star Scanner Observations at Amalthea”. Icarus 169 (2): 390–401. Bibcode 2004Icar..169..390F. doi:10.1016/j.icarus.2004.01.012. ^ Kerr, Richard A. (2004). “Did Jupiter and Saturn Team Up to Pummel the Inner Solar System?”. Science 306 (5702): 1676. doi:10.1126/science.306.5702.1676a. PMID 15576586. http://www.sciencemag.org/cgi/content/full/306/5702/1676a?etoc 2007年8月28日閲覧。. ^ Quinn, T.; Tremaine, S.; Duncan, M. (1990). “Planetary perturbations and the origins of short-period comets”. Astrophysical Journal, Part 1 355: 667–679. Bibcode 1990ApJ...355..667Q. doi:10.1086/168800. ^ Nakamura, T.; Kurahashi, H. (1998). “Collisional Probability of Periodic Comets with the Terrestrial Planets: An Invalid Case of Analytic Formulation” (英語). Astronomical Journal 115 (2): 848–854. Bibcode 1998AJ....115..848N. doi:10.1086/300206. http://www.iop.org/EJ/article/1538-3881/115/2/848/970144.html 2011年5月5日閲覧。. ^ Horner, J.; Jones, B. W. (2008). “Jupiter - friend or foe? I: the asteroids”. International Journal of Astrobiology 7 (3–4): 251–261. arXiv:0806.2795. doi:10.1017/S1473550408004187. ^ Tabe, Isshi; Watanabe, Jun-ichi; Jimbo, Michiwo (February 1997). “Discovery of a Possible Impact SPOT on Jupiter Recorded in 1690”. Publications of the Astronomical Society of Japan 49: L1–L5. Bibcode 1997PASJ...49L...1T. ^ Rogers, J. H. (1998). “Origins of the ancient constellations: I. The Mesopotamian traditions”. Journal of the British Astronomical Association, 108: 9–28. Bibcode 1998JBAA..108....9R. ^ Xi, Z. Z. (1981). “The Discovery of Jupiter's Satellite Made by Gan-De 2000 Years Before Galileo”. Acta Astrophysica Sinica 1 (2): 87. Bibcode 1981AcApS...1...87X. ^ Dong, Paul (2002). China's Major Mysteries: Paranormal Phenomena and the Unexplained in the People's Republic. China Books. ISBN 0-8351-2676-5. ^ tr. with notes by Walter Eugene Clark (1930). The Aryabhatiya of Aryabhata. University of Chicago Press. p. 9, Stanza 1. http://www.archive.org/download/The_Aryabhatiya_of_Aryabhata_Clark_1930/The_Aryabhatiya_of_Aryabhata_Clark_1930.pdf. ^ Dunham Jr., Theodore (1933). “Note on the Spectra of Jupiter and Saturn”. Publications of the Astronomical Society of the Pacific 45: 42–44. Bibcode 1933PASP...45...42D. doi:10.1086/124297. ^ Youssef, A.; Marcus, P. S. (2003). “The dynamics of jovian white ovals from formation to merger”. Icarus 162 (1): 74–93. Bibcode 2003Icar..162...74Y. doi:10.1016/S0019-1035(02)00060-X. ^ p. 150, Spacecraft systems engineering, Peter W. Fortescue, John Stark, and Graham Swinerd, 3rd ed., John Wiley and Sons, 2003, ISBN 0-470-85102-3. ^ Hansen, C. J.; Bolton, S. J.; Matson, D. L.; Spilker, L. J.; Lebreton, J.-P. (2004). “The Cassini-Huygens flyby of Jupiter”. Icarus 172 (1): 1–8. Bibcode 2004Icar..172....1H. doi:10.1016/j.icarus.2004.06.018. ^ Sagan, C.; Salpeter, E. E. (1976). “Particles, environments, and possible ecologies in the Jovian atmosphere”. The Astrophysical Journal Supplement Series 32: 633–637. doi:10.1086/190414.